Technology is always changing. This disrupts how we live and work. However, at DVL we recognize that one thing in particular should not be changing—continuity. Your business needs continuous access to its data to survive, and chances are, you are often the person responsible for assuring this happens. DVL is your trusted partner to help make this possible. Offering Liebert® power and cooling products from Vertiv™, our 24-7 service, and our industry leading data center engineers, we help you provide the continuity your business needs. Keeping your IT spaces cool and your power on is our goal. Check out Vertiv’s new video and join us as Architects of Continuity™. Together, we can ensure your digital infrastructure runs continuously and evolves as your business changes. Columbus, Ohio [September 16, 2015] – Emerson Network Power, a business of Emerson, (NYSE: EMR) and the world’s leading provider of critical infrastructure for information and communications technology systems, today announced that the California Energy Commission (CEC) has approved the use in California data centers of the Liebert® DSE thermal management system with the Liebert EconoPhase Pumped Refrigerant Economizer. The Liebert DSE system represents a break-through technology that uses no water and saves up to 50 percent of thermal energy, through its patented design and advancedLiebert iCOM™ controls. “The Liebert DSE system is a great environmental steward. When used in a typical mid-sized data center of one megawatt load, the Liebert DSE is significantly more efficient than current cooling systems, and eliminate the use of around four million gallons of water each year. 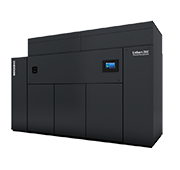 If deployed broadly in California data centers, the Liebert DSE with EconoPhase could save hundreds of million gallons of water every year,” said John Peter Valiulis, vice president North America marketing, thermal management, Emerson Network Power. The CEC has approved the Liebert DSE system with Liebert EconoPhase as a prescriptive economization option, as part of Title 24 of the the CEC’s 2103 Building Energy Efficiency Standards For Residential and Non Residential Buildings, meeting the code’s requirements for energy efficiency and its prescriptive requirements for economizers. The Liebert DSE system eliminates the need for any water in the heat rejection process and associated chemical water treatment, and it eliminates the risk of exposure to harmful waterbound bacteria. In addition, the Emerson modeling for the CEC compliance program demonstrated an 8 to 10 percent reduction in the data center Time Dependent Valuation measure, compared to the water economizer prescriptive option. The Liebert DSE system design also reduces or eliminates several of the power components associated with water economizers. In actual usage, the entire Liebert DSE system has demonstrated thermal system energy savings of up to 50 percent over older legacy systems. For more information on Emerson Network Power’s Liebert DSE with EconoPhase or other products and solutions, visit www.EmersonNetworkPower.com. Emerson Network Power, a business of Emerson, is the world’s leading provider of critical infrastructure technologies and life cycle services for information and communications technology systems. With an expansive portfolio of intelligent, rapidly deployable hardware and software solutions for power, thermal and infrastructure management, Emerson Network Power enables efficient, highly-available networks. Learn more at www.EmersonNetworkPower.com. Emerson, based in St. Louis, Missouri (USA), is a global leader in bringing technology and engineering together to provide innovative solutions for customers in industrial, commercial, and consumer markets around the world. The company is comprised of five business segments: Process Management, Industrial Automation, Network Power, Climate Technologies, and Commercial & Residential Solutions. Sales in fiscal 2014 were $24.5 billion. For more information, visit www.Emerson.com.